Mayor DANIEL HOAN declared the week of July 16, 1933 the “Milwaukee Homecoming.” Inspired by ethnic festivals he observed on a recent trip to Europe, Hoan transformed the upcoming Elks National Convention of 1933 into a similar gathering in Milwaukee. Convention organizers opened activities to all Milwaukee citizens as well as to the visiting Elks. Free admission appealed to cash-strapped, Depression-era citizens starved for entertainment. 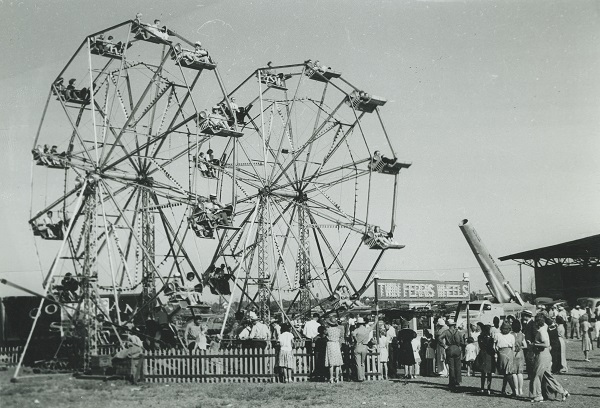 Following the successful display of fireworks, boat races, swimming contests, carnival rides, BEER GARDENS, and ethnic pageants, Hoan made it an annual event co-sponsored by city and county officials, and it was renamed the Midsummer Festival in 1935. Running until 1941, when the outbreak of war shifted Milwaukeeans’ focus to national events, the Midsummer Festival is considered a predecessor to Milwaukee’s SUMMERFEST. ^ Victor Greene, “Dealing with Diversity: Milwaukee’s Multiethnic Festivals and Urban Identity, 1840-1940,” in Perspectives on Milwaukee’s Past, eds. Margo Anderson and Victor Greene (Urbana: University of Illinois Press, 2009), 301. ^ John Gurda, “The First Summerfest, 1930s-Style: Depression Spawned the First of Milwaukee’s Lakefront Festivals,” in Cream City Chronicles: Stories of Milwaukee’s Past (Madison: Wisconsin Historical Society Press, 2007), 255. ^ “Festival Time at Hand Again—City Awaits Opening Saturday,” The Milwaukee Journal, July 12, 1940. ^ John Gurda, “The First Summerfest, 1930s-Style,” 255. Greene, Victor. “Dealing with Diversity: Milwaukee’s Multiethnic Festivals and Urban Identity, 1840-1940.” In Perspectives on Milwaukee’s Past, edited by Margo Anderson and Victor Greene, 285-315. Urbana: University of Illinois Press, 2009. Gurda, John. “The First Summerfest, 1930s-Style: Depression Spawned the First of Milwaukee’s Lakefront Festivals.” In Cream City Chronicles: Stories of Milwaukee’s Past, 255-258. Madison: Wisconsin Historical Society Press, 2007.